I just did 2 of those endurance races. 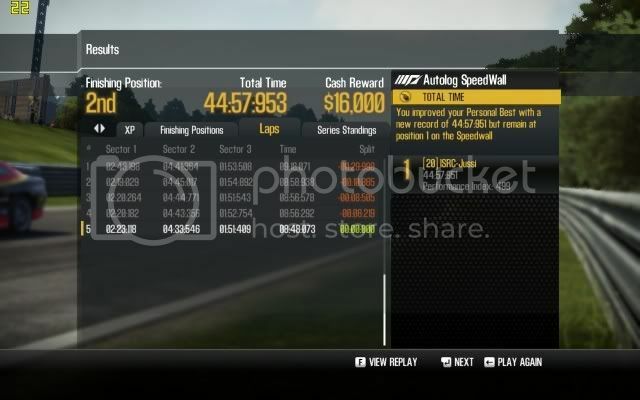 It took me almost an hour per race and I didn't even get valid time on the second one, due to running a bit wide trying to master corner seven at BRNO track. Luckily I managed to master all corners, so next time I try that track I can be more careful at that corner seven. 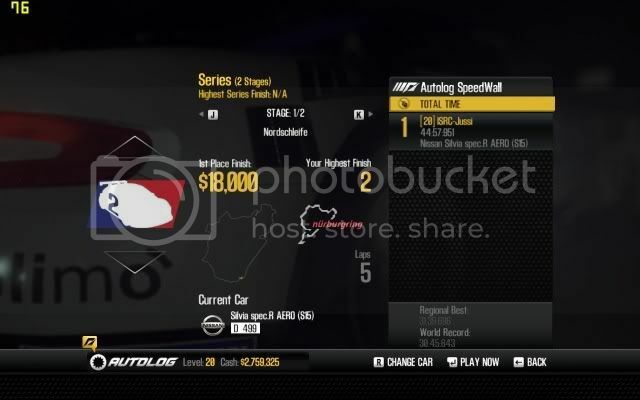 So, when ever you manage to get a valid time, post it here with screenshots showing your time and your car and car class (performance index). I'll collect all the results in this first post here. I've noticed that you can master corners no matter how slow you drive through them. In Shift 1 I seem to recall you needed a fair bit of speed to get it mastered, but not in S2U. 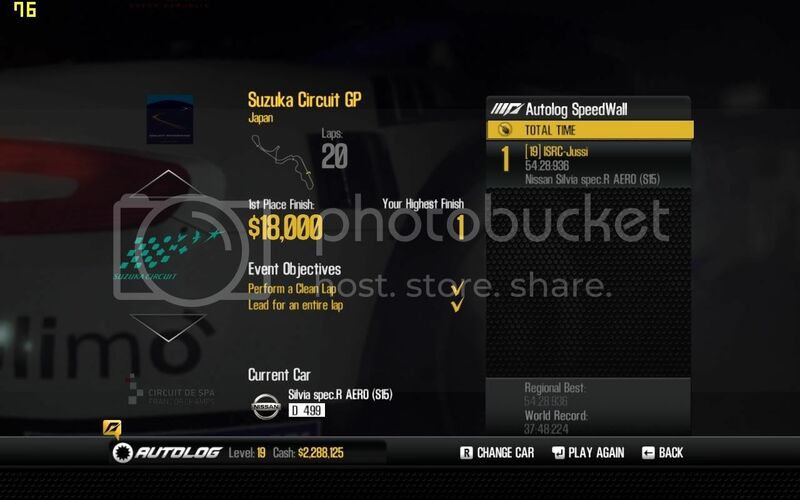 So for all the Time Attack races in the career, I would set a fast lap (or fast enough at least), then I'd spend the rest of the time just cruising round the track "mastering" it. Brno is the exception. There must be something wrong with that corner! Too bad about not getting a valid time though. It's a bit harsh to lose your time for going wide. 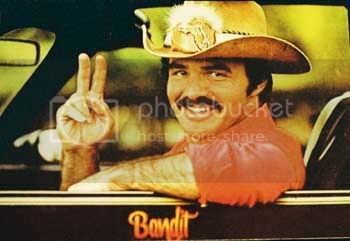 These races are 20 laps, aren't they? In Shift 1 there was a pre-order exclusive 75 lap race at Road America with the Porsche GT3. It was excruciating, but fun. Took me 2:55 to get through. As long as these races aren't at the dead of night, I will definately look into it. 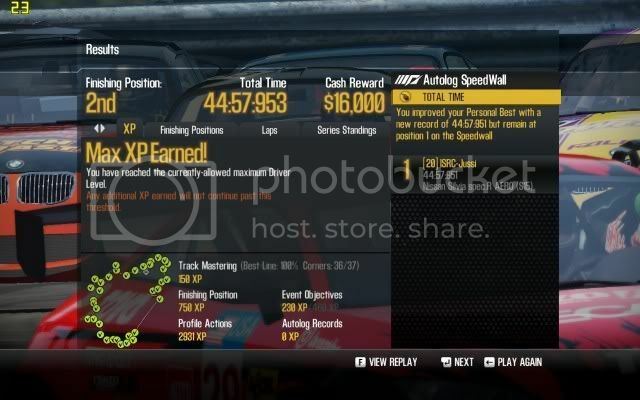 When ever you go off the track just a little bit and its not acceptable it will flash a warning that the lap time will not go to the wall, at that point you might as well restart the race because your race will not valid.. I've done it a few times myself I feel you're pain after a 20 lap race..
Darn, that happened to me on the Nordschleiffe and i was allready frustrated..
And that was only one lap! You still need to go pretty fast to get the corner mastered. I think I had done at least half of the laps at BRNO trying to get that 7th corner then I had a bit too much speed on the exit and slid slightly over the banking (or what ever you call those colorful jagged stones). That's it, no valid time. Since I had already been racing like a half an hour, I decided to continue, so I could get that last corner, which I finally did close to the end, but now I have to race it again to get a valid time. If you guys have any valid times on the wall, just take screens of those and post them here. I've got 2 done. I'll post them as soon as I can find the screens. PS. I'm sure you guys can do better, but I'm still proud of getting valid times (even though I almost fell asleep on the wheel towards the end). What does "QMile" mean in the car restriction? It seems most, if not all, cars are eligible. I have no idea what Quarter mile could mean here? I did the 5 lap Nordschleife day race today with Silvia. Why Silvia, you say? Well... I tried faster cars first, but at some point I always got off track and ruined mu chances for a valid time. That's why I picked a car slow enough to stay on track. It's only 5 times 9 minutes. You do not have to do Nordschleife 20 times, just 5 times. My best lap times with fast cars are just under 8 minutes, but I need someone to give me blue prints for maximum downforce, before I'll try this in a Lambo type of supercar again. I used a works Apollo, but I wouldn't recommend it. 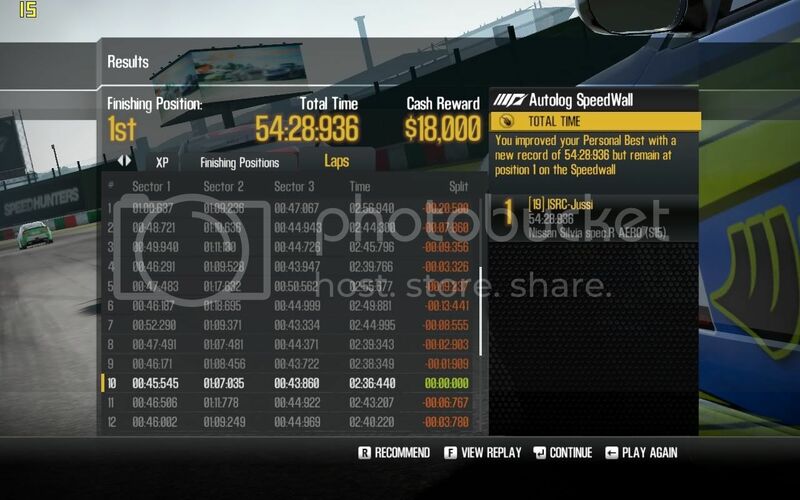 Got bumped off the track by the AI on my first "day" run so no time posted., I redid the day run, but don't plan to do the nite run again anytime soon, as I couldn't see far enough ahead and the green line goes away after 2 or 3 laps. 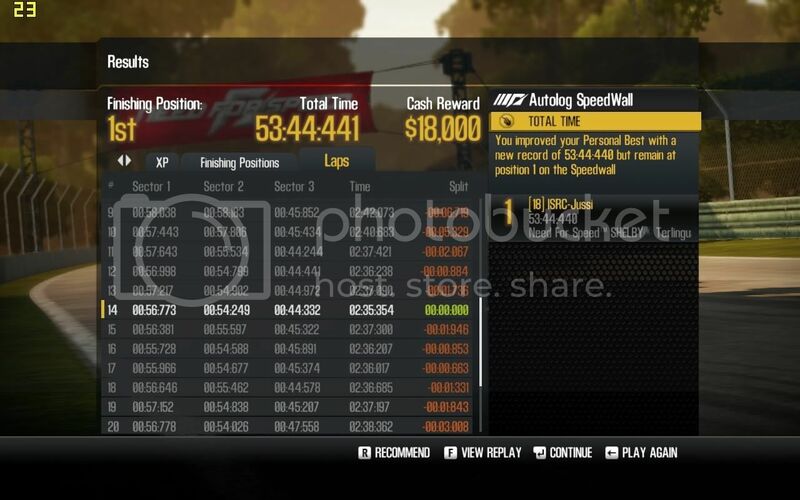 Then there are 1 or 2 AI cars that speed up in laps 4 and 5, runing 6:17 lap times while I was in the 6:20 to 6:30 range in the nite race, making it a close race. 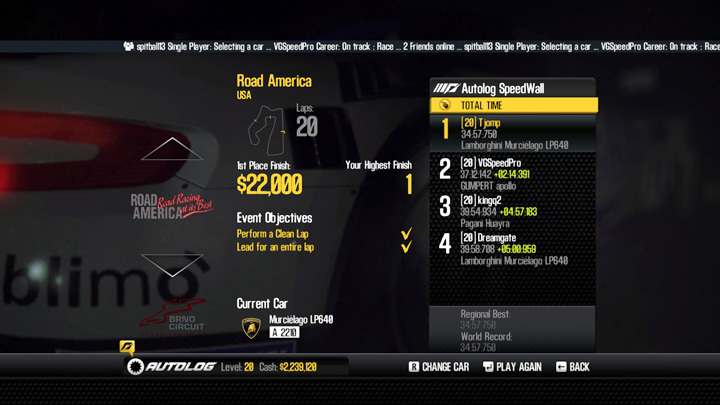 On top of that, I had two races where AI cars wrecked and were blocking the track, so I had redo the nite mode 3 times. I redid Nordschleife using windowed mode and gamma set so I could see the track and also get a clean lap, 32:29, only 12 seconds faster, but I did get the clean lap. 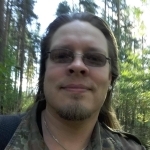 Here are the photos for the Norschliefe events. Did the race at Road America just now. I had 11 nice calm clean laps until I caught up with the first backmarkers. What a nightmare! If you catch up to them on a straight, they move politely over to the side, and I think they even slow down. But if you brake pass them before a corner, they drive as you aren't there. AI is really stupid in this game so the one who makes friends with them wins here. Congartulations on the World record, Tomas!